Every nonprofit organization resorts to digital communication and have got websites for the purpose, but not all of them are able to initiate a successful campaign to reach out to their audience, garner volunteer and subscribers, raise funds, and make an impact that lasts. As the digital communication takes the center stage, it has become essential for your non-profit institution to have an impressive website that connects with people, inspires them, and urge them to take actions when and how you want. Here are 5 things that you must consider while you pursue your website design and development task. In the hyperconnected world, consumers have got information at their fingertips. They don’t need to be spoon-feeded. All you need is to kindle the trust in them, and that will happen when you are straightforward in your communication. Hence, the non profit website design should provide ample and appropriate space to include engaging textual and visual content that convey information -- what you do, why you do, achievements, challenges, and the way forward thinking. Consumer advocacy is a powerful tool because people believe more in what is shared or liked by their friends and family than what is communicated by the organization itself. 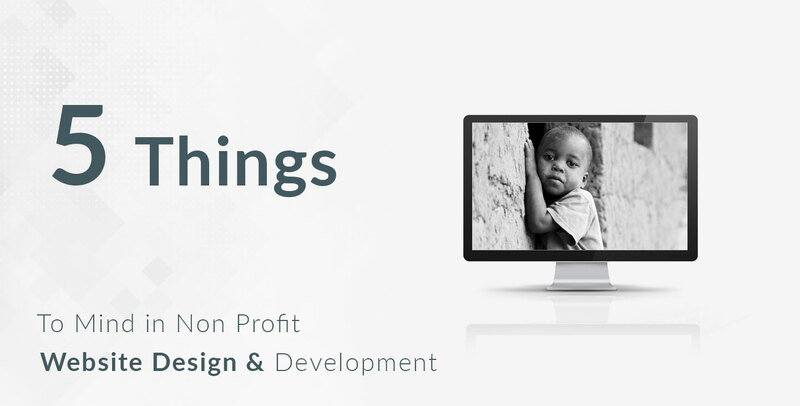 So, social APIs integration is a key element for non profit website development. Connect your website with Facebook, Twitter, Google + and other social media channels and enhance the prospect of getting your content shared on social. Be part of the website development process so that you can convey your preferences that best address your needs. Social APIs are easily available, but few people know that they can be customized as well. You can decide as how should your content get displayed when shared by a user. Make sure your post title, call to action, images, etc. appear impressive across social channels. Imagine, a user donated some fund on your website but encountered an error. He or she couldn’t get the corresponding receipt on his or her mail. This is a bad user experience certainly but becomes the worst, when he or she doesn’t get any way to confirm the transaction. There could be more similar situations, where users want instant answers. Interestingly, it can be done in a better way with the inclusion of a messaging section or chatbot. Based on your need and budget, you can go for the right chatbot. What are chatbots, and how they work? To get the answer, read one of our previous blogs. There are two chatbot options. First, the programmatic chatbot that responds to a pre-defined set of rules. And second, the AI chatbot that can respond judging the context of the conversation. Most of the amazing things in the world are simply skipped because of lack of fund. Hence, make the donation process as simple, fast and secure as you can. Ask your website development company to integrate the best payment gateway that provides more flexibility to the users. Get rid of unnecessary fields asking too many information from the users, and make sure to automate the donation acknowledgment process. The acknowledgment message can be customized with social sharing buttons. This might help you get more recommendation.